On an island full of resplendent Victorian architecture, the trend toward minimalist design has made its mark. 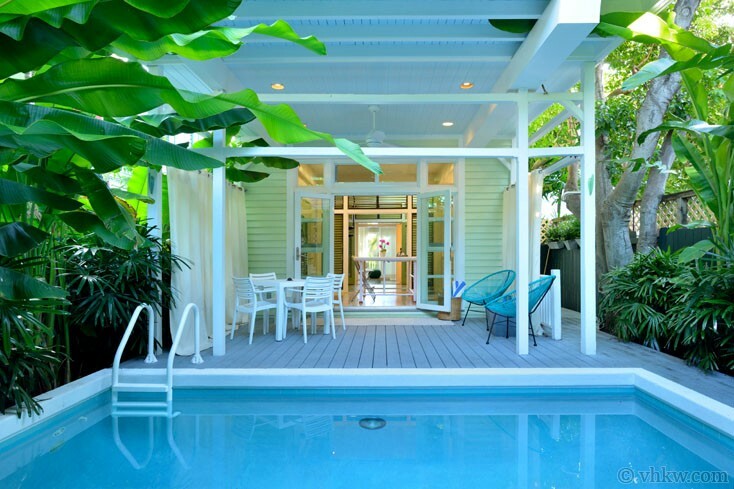 This 2-story tropical luxury home is a ubiquitous example of this, an ingenious melding of classic Old Town Key West architecture with contemporary pared-down design. Created by connecting twin side-by-side traditional wooden houses with a spacious entrance hall, the result is a striking 2 bedroom 2.5 bathroom home. 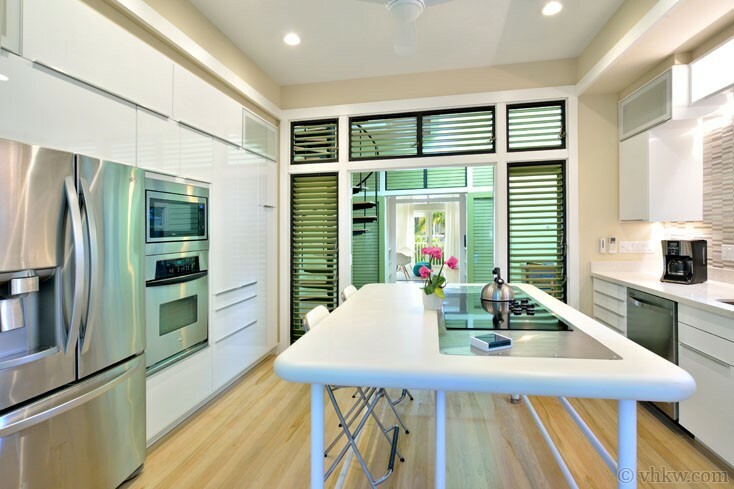 While the outside is Key West traditional, the interior is renovated with calming straightforward minimalism. 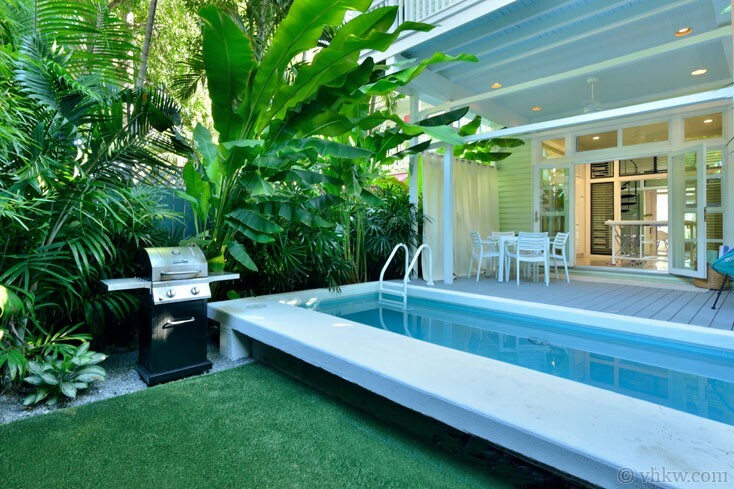 Throughout the Avant-Garde Key West Luxury Home vacation rental, design elements that mesh modern interior with traditional Key West architecture flow together to create elegant and comfortable living spaces in each room. Vaulted and open beam ceilings, floor-to-ceiling windows, sleek built-in cabinetry, ambient and accent lighting, and the swimming pool and deck in the back - signature to contemporary Key West luxury living. 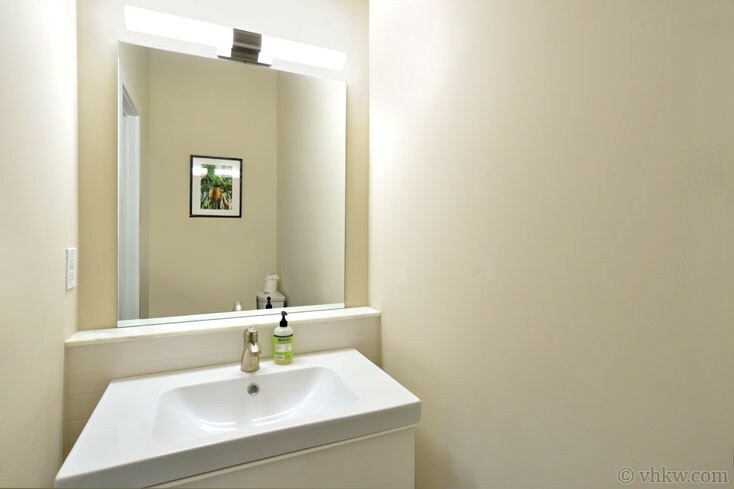 Sleek modern furnishings, toned-down colors, and light wood flooring throughout enhance the clean design. 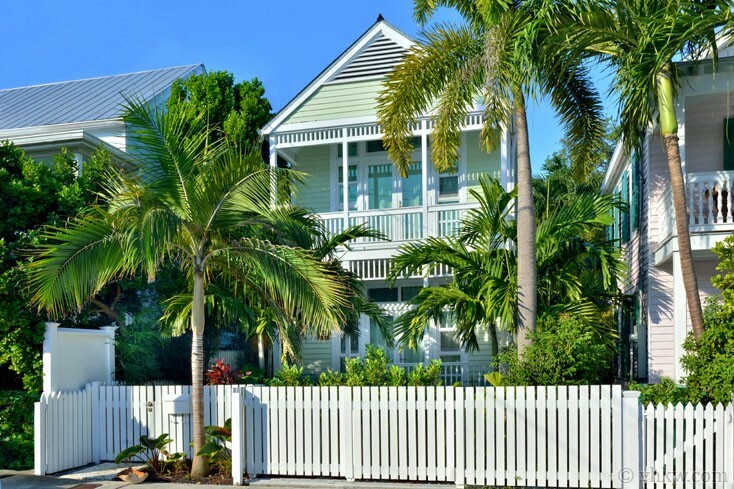 Before we begin our tour, take note of the stylized traditional front of this home, with all the endearing features of Key West vernacular architecture - yet not ornate or too gingerbready. Covered sitting porches on the 1st and 2nd floors, clapboard siding, peak vented roof, and white picket fencing, all displaying clean straight lines. Palm trees and exotic landscaping softly frame the front. To enter the home, we pass through a gate on left front of the house, and find the way to the spacious entry hall -the center of the house. The entrance hall is the architectural hub of the home, with linear rooms off both sides creating an open gallery effect. 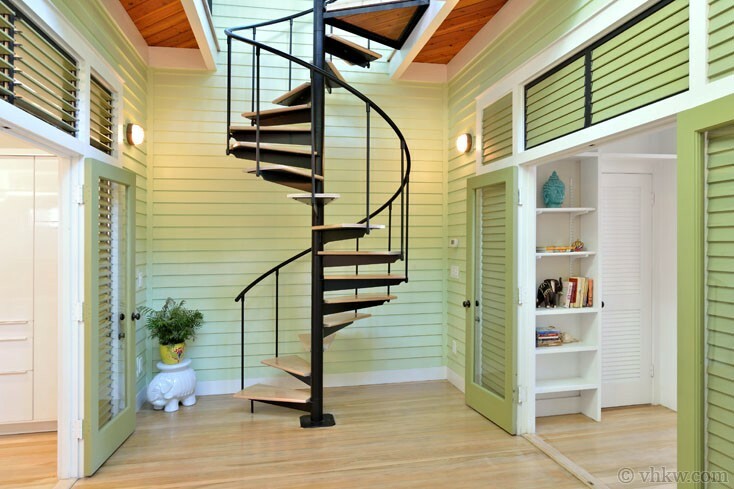 A room in-and-of-itself, the spacious entrance is open from floor-to-roofline, with a grooved natural wood ceiling. In the middle, the hall features a contemporary black metal and wood spiral staircase that leads to the 2nd floor via an atrium breezeway. The atrium serves as the 2nd floor hallway linking the bedrooms, and also creates a unique viewing point to the main entrance door below. When the downstairs doors are all open, the gallery effect gives a sweeping visual flow through the house - from the front living room, straight back to the kitchen, and continuing outside to the swimming pool and deck. 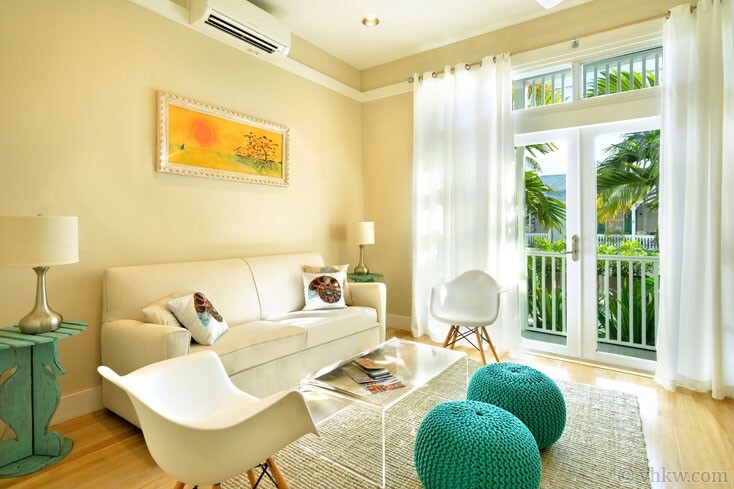 The living room area sets a contemporary beach tone, with monotone color scheme of sand and white accented with Caribbean blue. An elegant comfortable sofa and chair grouping, entertainment center with a 55” smart TV, is an invitation for relaxing inside. If you prefer to take in the fresh air, French doors open to the covered front porch, front yard, and garden at the front of the house. 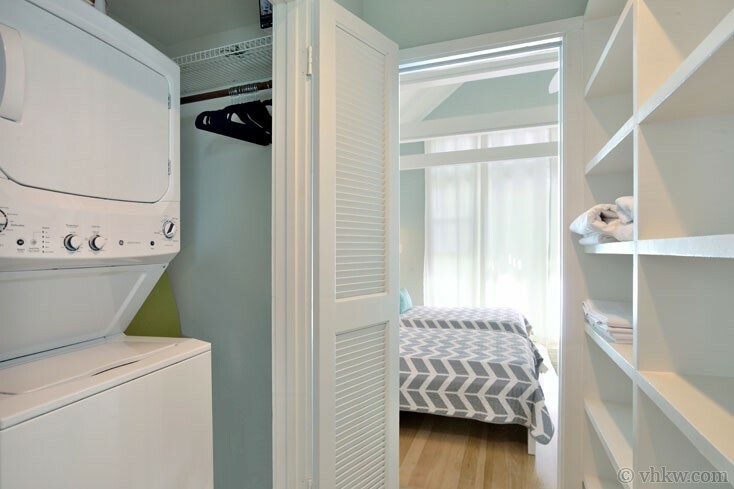 Back inside, just beyond the entertainment area, on both sides of the room, are built-in bookshelves with a door leading to a ½ bath (sink and commode) on one side, and a closet on the other. Kitchen: Moving toward the back of the house, through the entrance hall, is the deluxe kitchen. Shining with sleek white counter tops, glass tiles at the backsplash, top-of-the-line stainless appliances, and elegant task lighting, the kitchen is picture perfect, styled to inspire anyone who likes to cook. 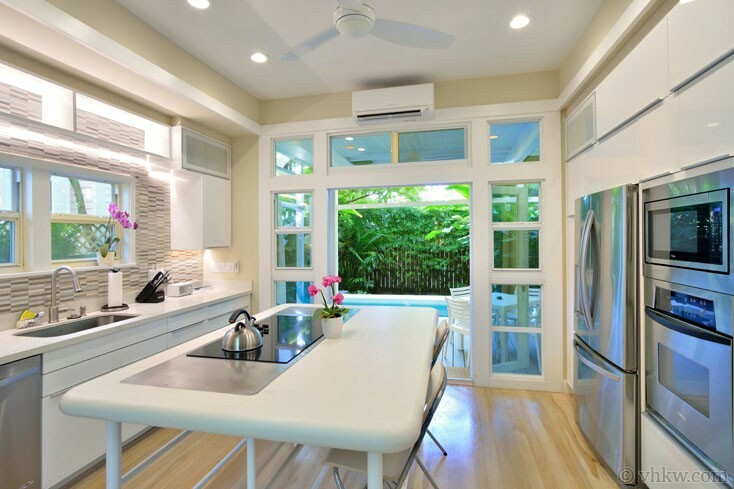 The stove top is set in the spacious center eating island, making it natural for meal preparation to be a social affair. Portico and Pool Garden: If you prefer dining al fresco, you’ll want to pass through the French doors and set the outdoor table in the portico, overlooking the symmetrical pool garden. Designed as a peaceful outdoor recreation room, here you are in the focal point of a luxury tropical home. The chic ambience of this outdoor space is simultaneously calming and stimulating, an ideal place to enjoy a meal, do yoga, and relax in the pool. 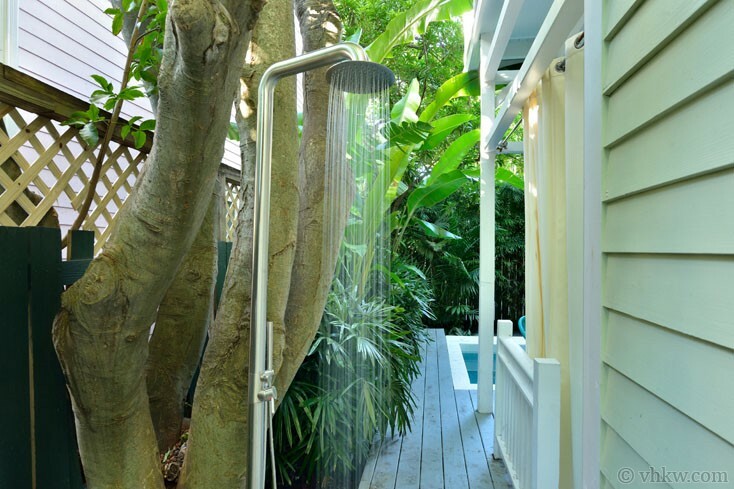 The lush tropical garden incorporates a wide variety of exotic trees and plants, plus an expected feature in any up-scale Key West home, an outdoor shower. Bedrooms with en-suite bathrooms: Moving back inside the house to the central hallway, the spiral staircase leads us to the 2nd floor, where we find the 2 bedrooms with en-suite bathrooms. Symmetrical to each other, the master bedroom is located on one side of the house, and across the breezeway, the guest room on the other. 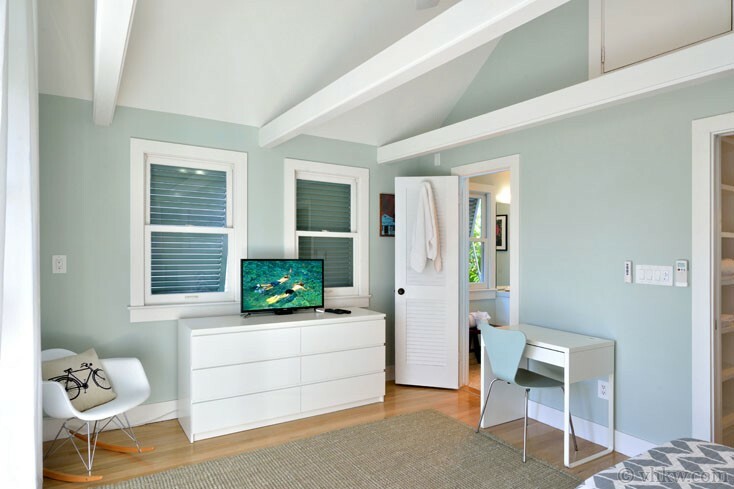 Both bedrooms are tastefully decorated in a matching minimalist décor. 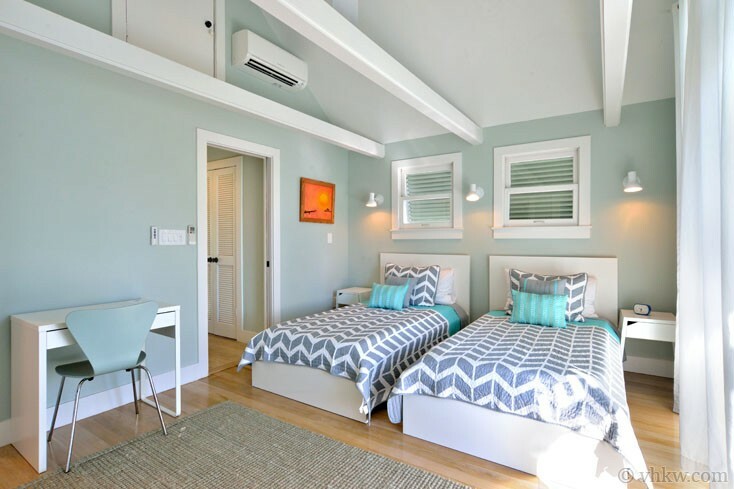 Painted in a soft grey-blue and white color scheme, the bedrooms feature cathedral ceilings with open white beams, sash windows on both sides of each room to assure plenty of natural light, and private balcony porches. Both bedrooms provide 32 inch smart TV’s, writing desks for lap-tops, walk-in closets with floor to ceiling shelving, and en-suite bathrooms. 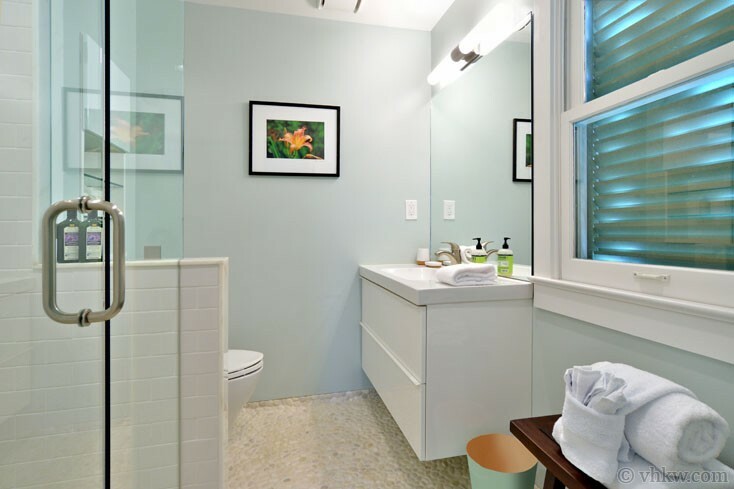 The bathrooms, decorated with the same subtle color scheme of the bedrooms, have contemporary white cabinetry style that matches the bedrooms, and each provides oversized tile showers with frameless glass doors. 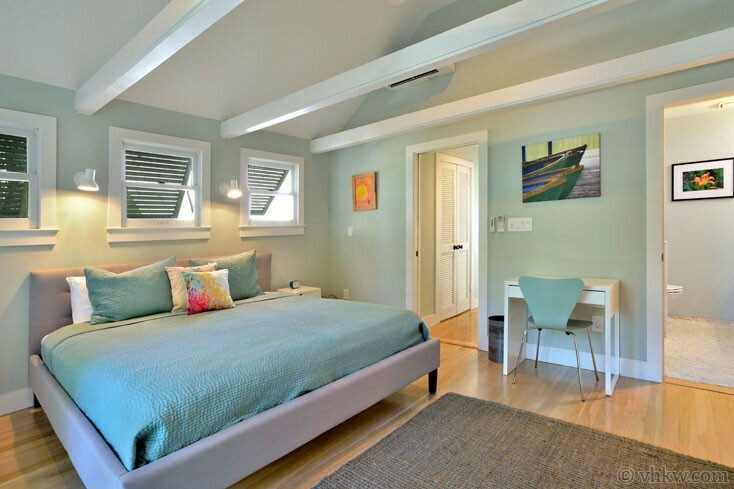 In addition to their position in the house, the main differences between the two bedroom suites are the bed sizes. The master bedroom is at the pool side of the house with its own private covered porch, overlooking the pool garden. It provides a king size platform bed placed one side of the room and opposite is custom white cabinetry spanning the length of the wall. Visa versa, the guest bedroom is across the hall on the charming street side of the house, where French doors open to a private covered front porch overlooking the garden below.. Offering two twin size platform beds on one side of the room, and a white dresser on the other, the walk-in closet in the guest bedroom also houses the washer / dryer for the house. The layout of this home makes it comfortable for a small family of 3 or 4, or two couples. 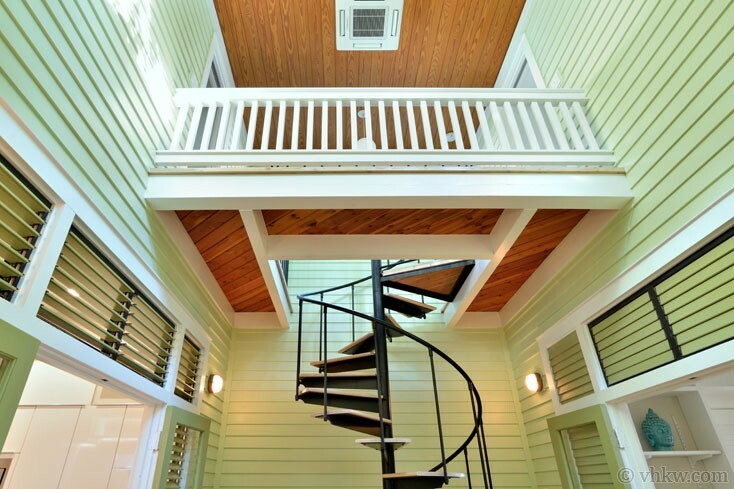 The home is offered as an exclusive vacation rental. Set by the owner for guests with discerning tastes, this home is ideal for guests who want to visit the island for a month or more. The property will not tolerate smoking inside. Only well behaved children are welcome. This property is not "child-proof". We do not accept guests under 25 years of age unless accompanied by a family group or guardian. Amenities: Up-scale modern renovation. 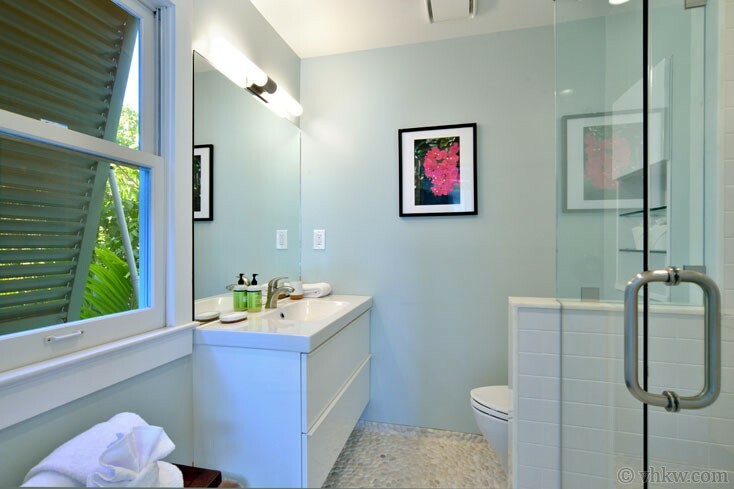 Fully equipped kitchen, private heated swimming pool, deck and garden courtyard. 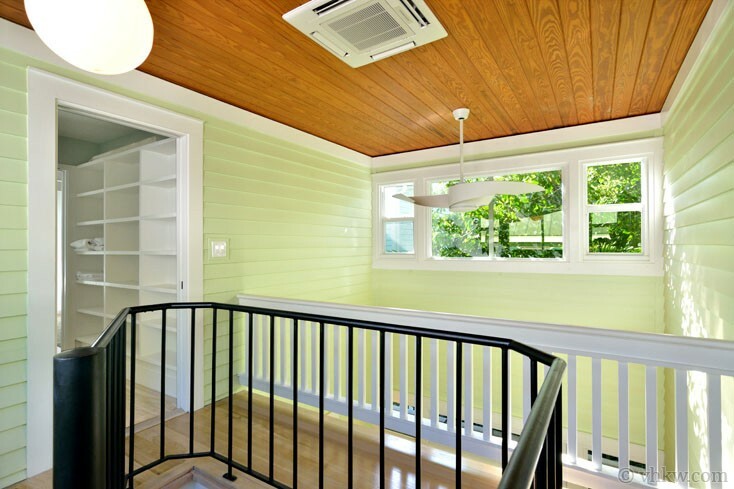 Ductless slit / system a/c with reverse heat pump units in each room for custom climate control. Internet, Cable TV and Netflix. 55 inch smart TV in living room. 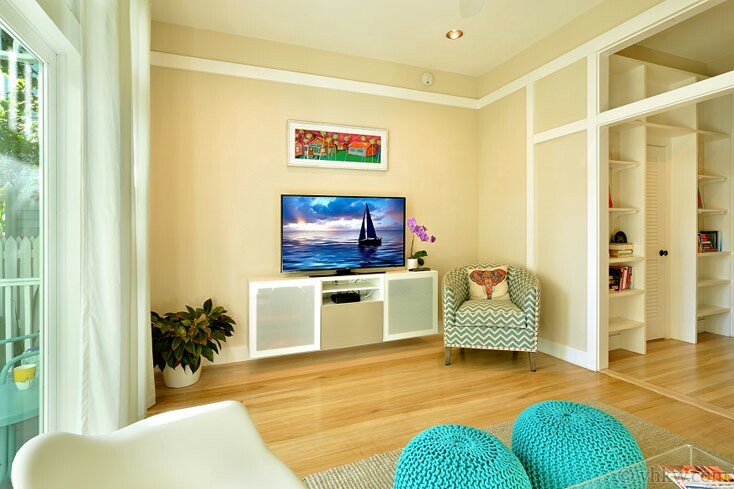 32 inch smart TV in each bedroom. Linens and towels provided. 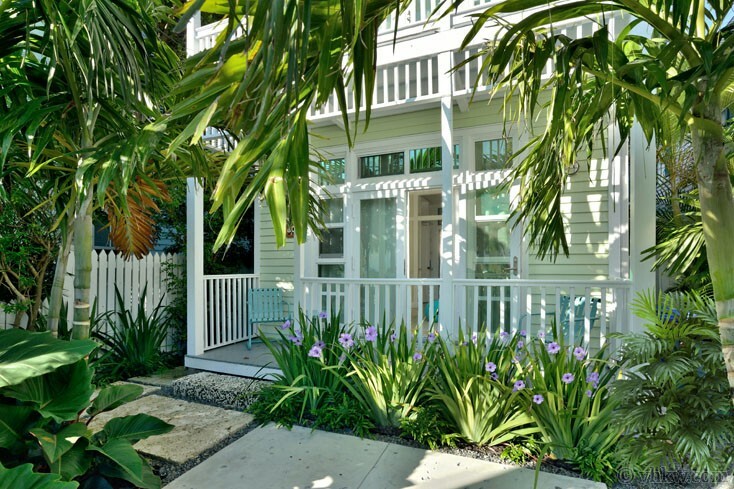 Activities: In a prime Old Town location, this home is an easy walk or bike to the famous Key West Historic Seaport, beaches, restaurants, and a lovely neighborhood to walk around in a take in the island lifestyle ambience. 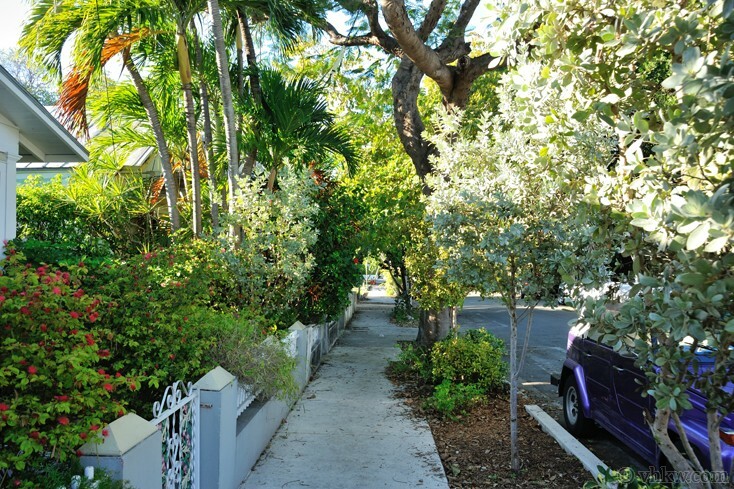 This is in one of the enviable Old Town neighborhoods and you can easily get to any activity. 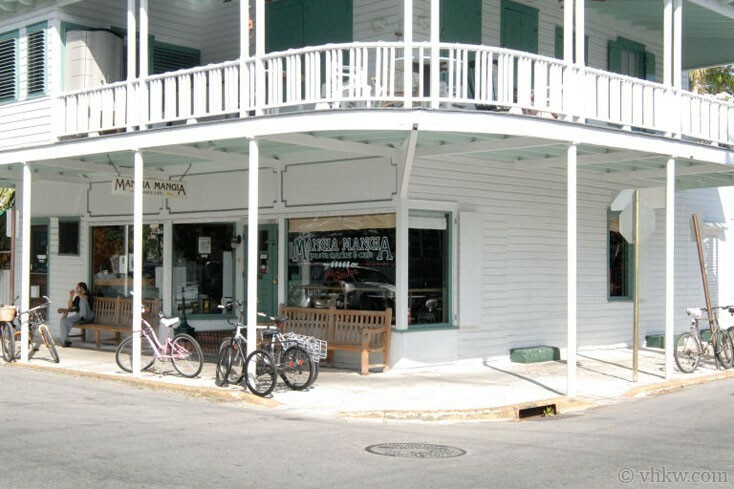 Famous Duval Street is about a 15 stroll away. Walk to all old town features, including museums, theaters, night life. Walk to Mallory Square Sunset Celebration in about 15 minutes. 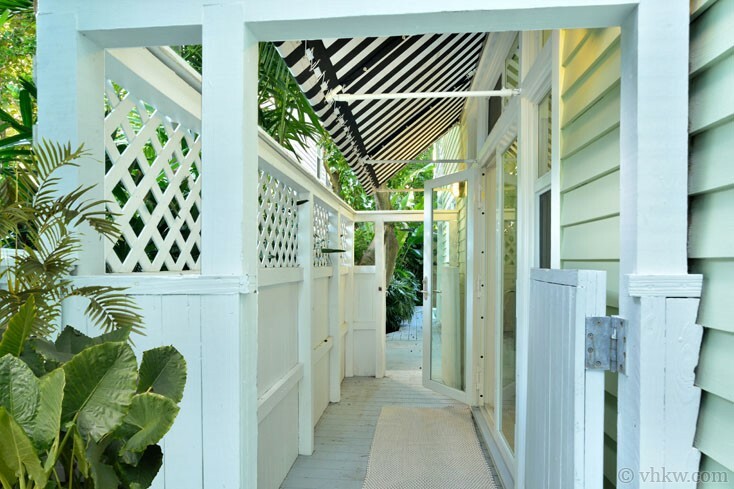 Area: This house is located in the residential Heart of Old Town Key West. Narrow historic streets and lanes are lined with wooden homes, from larger Victorians to tiny cottages. Original homes were built by early ship builders and men of wealth. 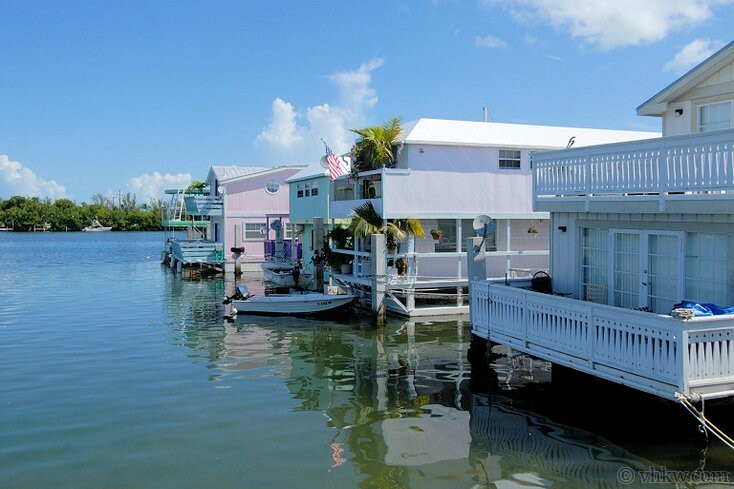 Some were even built in the Bahamas and brought by boat to Key West. Some famous people, past and present, live in this area, including Earnest. 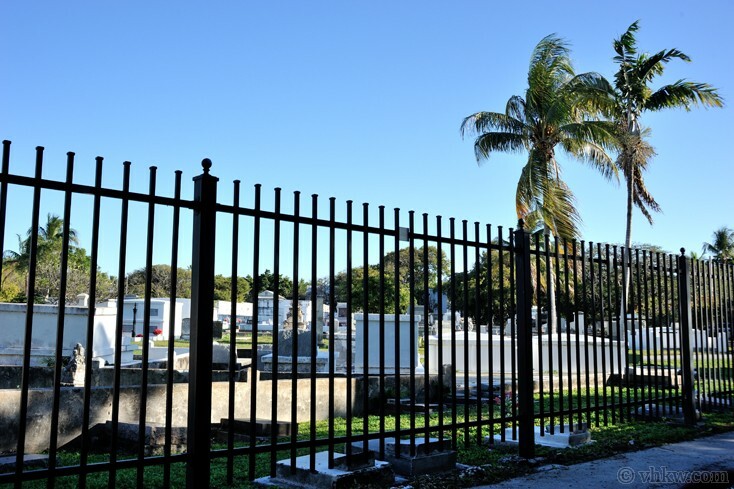 There are a variety of historic churches throughout neighborhood, and in the "center of the heart" of Old Town Key West is the historic graveyard. 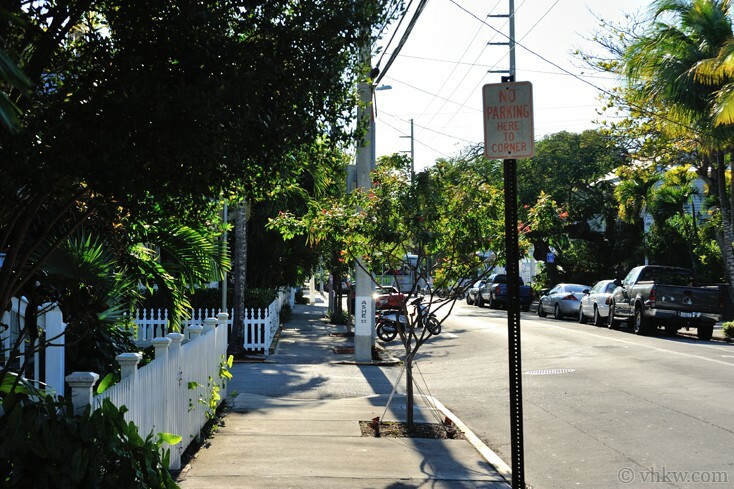 From this area you can walk to Duval Street in 5 to 20 minutes. Parking: There is one parking space in front of the house. However, from this location you do not need a car. Enjoy walking or biking everywhere, you'll see more that way. Restrictions: Smoke Free Property. No pets. Please don’t ask. We do not accept guests less than 25 years of age unless accompanied by a family group or guardian.